Urban theatre can be described as theatre made with or by those whose lives are marked by the urban landscape and its social limits and possibilities. At the heart of this text lies the question of how theatre can illuminate the urban and how theatre is illuminated by the urban. The city, like a play, is a space where everything adopts multiple meanings. It is an objective thought and a subjective experience, a charged and symbolic thing, as well as a real, material, lived reality. The chapters in this book illustrate the theatre’s uncanny ability to narrate and symbolize the physical and psychic space of the city. Running through all of the pieces presented are the themes of power and of young people’s sense of agency within the structures they dwell in and are shaped by. Through drama education and applied theatre practices, the affinity between the urban and its theatres is radically replaced by marginal spaces, boulevards and schools. As Guillermo Gómez-Peña suggests, the theatre has gone to the people to serve their local and immediate need for a means of holding the urban and the self so that both can be interrogated and re-imagined; so that the various dystopias of urban existence can be envisaged as places of urban solidarity and as utopias, at least, of the mind. This book was originally published as a special issue of Research in Drama Education: The Journal of Applied Theatre and Performance. Kathleen Gallagher is Professor and Canada Research Chair in Theatre, Youth, and Research in Urban Schools at the University of Toronto, Canada. Her award-winning books include, The Theatre of Urban: Youth and Schooling in Dangerous Times (2007) and Drama Education in the Lives of Girls: Imagining Possibilities (2000). 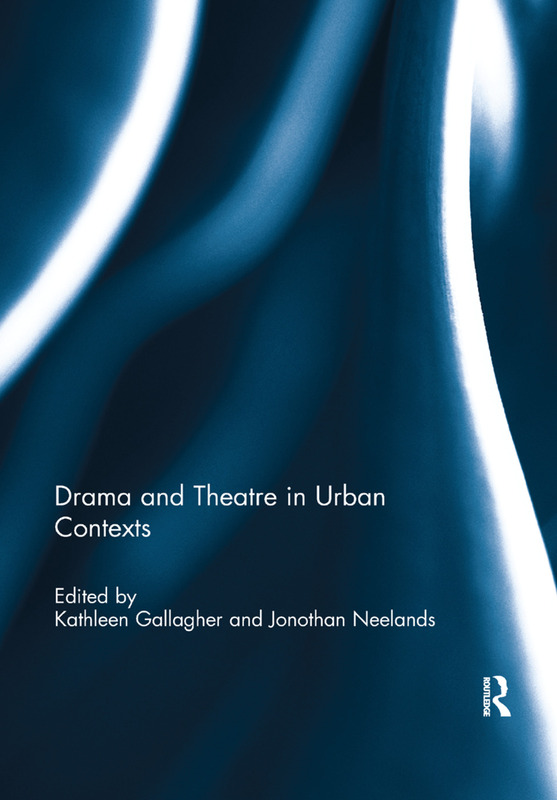 She has also published two edited collections: How Theatre Educates: Convergences and Counterpoints with Artists, Scholars, and Advocates (2003) and The Methodological Dilemma: Creative, Critical and Collaborative Approaches to Qualitative Research (2008). Dr. Gallagher has published many articles on theatre, youth, pedagogy, methodology and gender and travels widely giving international addresses and workshops for practitioners. Her research continues to focus on questions of youth engagement and artistic practice, as well as the pedagogical and methodological possibilities of learning and researching with theatre. Professor Jonothan Neelands Ph.D is a National Teaching Fellow, Associate Dean of Creativity at the Warwick Business School (WBS) and Chair of Drama and Theatre Education in the Institute of Education at the University of Warwick, UK. He is the Strategic Academic Lead for Teaching Shakespeare, which is a joint venture partnership between the Royal Shakespeare Company and the University of Warwick. In addition to his academic profile, he is an experienced workshop leader and drama practitioner. Research interests include: the theory and practice of drama and theatre education, models of cultural and creative learning, and the politics of cultural and education policy-making. He has also advised government on the identification and training of exceptionally able and motivated young performers and is Research Consultant for the theatre industry’s National Council of Drama Training. Previous publications include Structuring Drama Work, Beginning Drama 11-14, Key Shakespeare 1 and 2 and Drama and Theatre Studies at A/S and A level. His latest publication is Improving Your Primary School Through Drama.